If you want to start your business, spend most of your time building relationships, not tinkering around on your product or service. Ben Walker shares how he built his business from scratch by regularly attending conferences to develop relationships with his target customer. His story is a great illustration of The Niche Tribe Model I taught in episode 214. 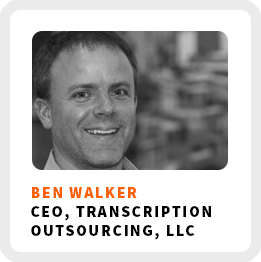 Ben is the founder and CEO of Transcription Outsourcing LLC, a leading global provider of premium transcription services in a variety of fields from medicine to education. Diversifying your business model to adapt to changing markets and technology. Having a backup plan for your current career path. How he started his business from scratch by going to conferences and taking on anything people needed. How he built his email marketing strategy one email at a time. Core work activities + habits: 1) Email. 2) Writing. 3) Requests for proposals. Ideal work environment: In a busy restaurant or Starbucks, by himself. 90-day goal: Hiring a new director of operations. 1) Go to events like conferences to get into the community that you’re serving. 2) Learn as much as you possibly can about the field you’re working in and your customers.